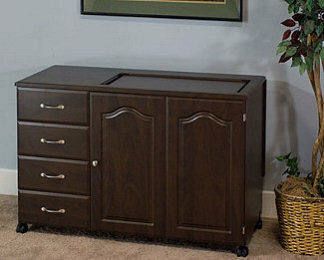 Shown here in our new Swiss Chocolate Color, the 5610 sewing cabinet will improve the appearance of any sales floor and every sewing room. 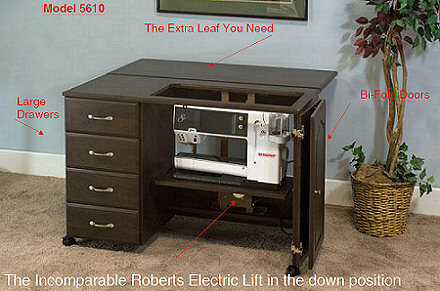 The large drawers and the Electric Lift make it a must for the professional homemaker. Also available in Rustic Maple and White. This is the pride of the fleet and the choice of many homemakers that buy sewing cabinets because it fits the modern decors. The large drop-down leaf is the frosting on the cake! Swiss Chocolate, introduced to America by Fashion Sewing Cabinets, is the talk at every convention. 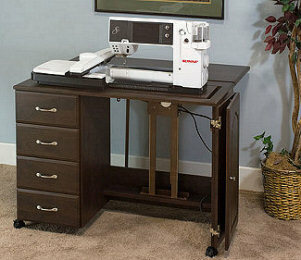 This sturdy sewing cabinet handles the larger sewing machines and their embroidery modules. Our engineers have solved the vibration problems caused by the larger sewing machines. Each 5610 comes with a Vibration Lock that locks the lift deck in place. Opening is 27" by 11 5/8"